Val d’Aosta is a tiny region nestled among the Italian Alps in the northwest corner of Italy, at the intersection of France, Switzerland and Italy. It is the smallest and least populous region of Italy, and French is one of its official languages, along with the Italian. The region is known for its rustic, hearty cooking with clear Gallic influences, and this rich beef and red wine stew is certainly no exception. Carbonade valdostana may sound like many other red wine beef stews, but its liberal use of butter, herbs and spices lends it a special mellow but intriguing flavor well worth trying out. Originally made from beef preserved in salt, today you can pre-salt the beef for a truly authentic experience (see Notes) or simply season the dish generously for an ersatz but still very acceptable updated version. This carbonade valdostana is quite different in taste from its much more famous beer-braised Flemish cousin, which we featured some time ago. Both, in my book, are equally delicious. Cut the beef either into cubes or large strips, as you prefer. Lightly flour the cubes or strips and brown them in the butter in a large braising pan until golden brown on all sides. The flame should be lively, but be careful to adjust the temperature so the butter doesn’t burn. (A drizzle of vegetable oil helps to this end, even if it’s not traditional.) Make sure the pieces are well-spaced so they brown nicely; proceed in batches if you need to. Remove the pieces from the pan as they’re done. Add the onion to the pan and sauté gently until the onion is soft and translucent, seasoning with salt and pepper as you go. Add back the beef and turn everything together, seasoning again. Let the beef and onions simmer together for a few minutes, then add enough red wine to barely cover the beef. Nestle the herbs and spices in the pot among the beef pieces. Cover and let the pot simmer very gently until the beef is perfectly tender, about 1-1/2 to 2 hours, depending on the quality of beef and the size of your pieces. Be sure to stir from time to time, as the sauce tends to stick to the bottom of the pot. Add more wine or water if need be to keep things moist and loose, but let the sauce reduce towards the end. Serve piping hot over freshly made polenta. To give your carbonade valdostana that real old-fashioned flavor, sprinkle the meat with a dry marinade of salt and aromatic herbs and spices, place in a covered bowl and let rest in the fridge for a day or more before cooking. Otherwise, be generous, especially with the salt, when you season your carbonade. The herbs and spices are “a piacere“—whatever you fancy—but typical and very nice option would be a cinnamon stick, a few cloves, a generous scrape of nutmeg, freshly grated pepper, a bay leaf, a sprig or two of thyme and a few sage leaves. Some recipes for carbonade valdostana call for a lean cut of stewing beef (in the US, this would be something like the rump or round) but I much prefer chuck (i.e., the shoulder) which has lovely marbling that keeps the meat nice and moist and falling apart tender when it is cooked. According to Le ricette regionali italiane (Solares), carbonade valdostana has many local variations: in some villages the meat is cut into cubes, while in others it is cut into slices, still others into strips. Some places use beer as in the Belgian version of this dish, while some places add broth and/or a pinch of sugar. By the way, carbonade goes by many similar names and spellings. It is also spelled carbonnade and sometimes called carbonada or carbonata. Cut the beef either into cubes or large strips, as you prefer. Lightly flour the cubes or strips and brown them in the butter in a large braising pan until golden brown on all sides. The flame should be lively, but be careful to adjust the temperature so the butter doesn't burn. (A drizzle of vegetable oil helps to this end, even if it's not traditional.) Make sure the pieces are well-spaced so they brown nicely; proceed in batches if you need to. Remove the pieces from the pan as they're done. To give your carbonade valdostana that real old-fashioned flavor, sprinkle the meat with a dry marinade of salt and aromatic herbs and spices, place in a covered bowl and let rest in the fridge for a day or more before cooking. Otherwise, be generous, especially with the salt, when you season your carbonade. The herbs and spices are "a piacere"—whatever you fancy—but typical and very nice option would be a cinnamon stick, a few cloves, a generous scrape of nutmeg, freshly grated pepper, a bay leaf, a sprig or two of thyme and a few sage leaves. Thanks for your site and this recipe – made it last night and happened to have a Valle d’Aoste red around too. Perfect weather, food and wine combination! Sounds wonderful, Jonathan. Thanks for your feedback! Frank, I was not familiar with this dish and appreciate you bringing to my attention. Imagine sitting in front of a roaring fire on a snowing evening with this heartwarming dish on the table. 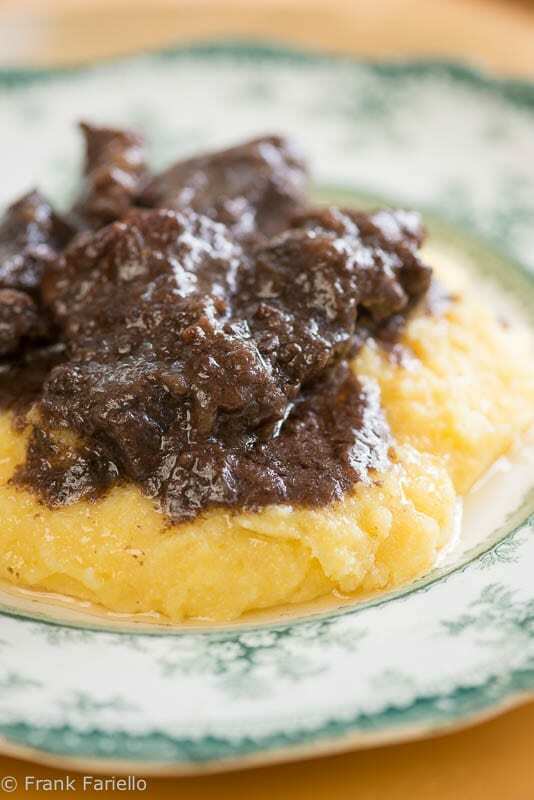 Love hearty beef-things served over polenta. I’ve never had anything exactly like this — looks wonderful. Thanks! And thanks for stopping by, John! What a fantastic looking dish! We do like using dry rubs on our meat and letting them sit — you get a lot of flavor from it. This reminds me of our Italian venison stew over polenta. Real northern Italian flavors. I’d love to visit the Val d’ Aosta — you provide such delightful informatin. Buon fine settimana. We have been exploring a variety of beef “stews” from different regions of Italy and look forward to adding this one to our repertoire. It is, indeed, very different from its Flemish counterpart, but I can already tell I like this better. Thanks, Frank… now, all we need is a couple of cool days to make this. From your comment, I guess you’re having very different weather from us… !!! Unless you are having highs in the 70°s, our weather is definitely different! Hoping for a cold snap soon! Wonderful. Isn’t that where fontina is from? We wanted to get over the Alps from Chamonix for a visit but ran out of time. Yes, indeed. They also make a very nice cheese called toma, which is hard to find Stateside, but is related to (or the same as?) the French tomme, which you can find in many cheese shops/counters. It’s also excellent! When I see the instruction “Cover and let the pot simmer very gently until the beef is perfectly tender, about 1-1/2 to 2 hours”, my immediate thought is: How about a pressure cooker? Have you braised this in a PC? And if so, any suggestions for timing or modifications? Obviously, use enough red wine and/or (broth?) to meet the PC minimum liquid. Sure. I’ve made this in the pressure cooker as well. In terms of timing, 15-20 minutes under high pressure, depending on the size of your pieces, then letting the pot release pressure by itself, should do the trick. (I’ve done short ribs as well, which take 30 minutes or so.) Since there’s less evaporation when pressure cooking, I’d use somewhat less wine, then reduce the sauce if need be afterwards. You should be careful to flour the beef lightly, if at all, before browning—a thickened sauce scorches very easily under the intense heat of a pressure cooker. Use a flour and butter paste if you want to thicken the sauce afterwards. Enjoy! Although it is very close, Val d’Aosta is one of the mountain regions in Italy I know the least. I have heard of this dish of course, but never had it. Sound like it is full of flavor and delicious. What an inviting dish on a night like this – snowing on the first day of spring. It’s perfect served over polenta, as you show. Yes, indeed. This was intended to be our “goodbye” to winter dish, but it may have to do double-duty! piatto perfetto per una serata con amici davanti al caminetto acceso,buon fine settimana Frank ! Buon fine settimana anche a te, Chiara! This couldn’t be more welcoming. Love that it’s prepped ahead with the herbs and salt – a fine twist on the French version that soaks over night in wine. Gorgeous presentation!